This keyless remote programming instructions work for BLACK REMOTE remote with part # PT398-07100, 08191-00870, FCC id BAB237131-022 on the back of it. 1. Turn the ignition ON using your key but don't start the engine. 2. Look for the Valet button/switch then press and hold it for 3 seconds. (see figure). Use a pencil or any object to poke through the Programming Button access hole. 3. On the dash or center console you'll see the status monitor LED which will turn ON for 5 seconds. For some vehicles, you'll hear a double chirp of instead of the flashing light. 4. In 5 seconds press the remote TOP or BOTTOM button (Either of these 2 button can be programmed to the system. 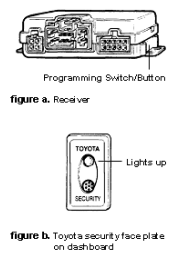 The other button can be programmed to operate a second Toyota vehicle with the same system). 5. STATUS MONITOR LED will turn off, you'll get a chirp then the exterior lights flash once. In some cases, the only response is a single horn chirp. 6. To program another remote just repeat step 2 to 4. 7. Turn OFF the ignition using your key to exit from programming mode.